Feed additives and supplements have a vital existence pertaining to the performance enhancement of dairy animals as well as poultry. Presently, they are very important for feed formulation and vital for the preparation of a balanced diet. Major type of additives and supplements that are being used are prebiotics, antibiotic growth promoters, probiotics, mould inhibitors, toxin binders, enzymes, anti-coccidial supplements, amino acids, acidifiers, by-pass fat, non-antibiotic growth promoters, antioxidant and more. Many of these products are imported from developed countries. Fishmeal and meat-meal are the most popularly used poultry feed owing to their high production and availability, better consciousness a well as better meal in most poultry rations. However, the quality of fishmeal is degrading which has consequently led soybean meal to replace fishmeal and meat. Meat-meal, fishmeal, bone-meal and dicalcium phosphate of bone origin are the basic raw ingredients existing for animal feeding. Moreover, government has set nutritional standards for cattle and poultry keeping in mind numerous factors which include genotype, environment, quality of available raw materials, maintenance methods, production and reproduction requirements and more. Major types of feed fats and proteins commercially available based on their source are meat & bone meal, blood meal, corn, soybean, tallow and more. The report also focuses on different geographic regions and the key countries in terms of changing trends in feed fats and proteins market in various fields. The feed fats and proteins market is segregated on the basis of source which includes animals, plants and others. Moreover by livestock, the market is segmented into ruminants, poultry, swine, equine, aqua and others. An animal needs proteins and fats in suitable quantity in order to pure lactation, growth and reproduction, disparity or deficits of the same will cause a sub-optimal performance and health of the animal. Moreover, there is a continuous necessity to deliver extra support in improvement of animal production systems and their related feeding prerequisites in developing countries. The available livestock are the major driver for the feed, fats and proteins market to grow. feed, fats and proteins derive their in various livestock like ruminants, poultry, aqua, swine, equine and more. 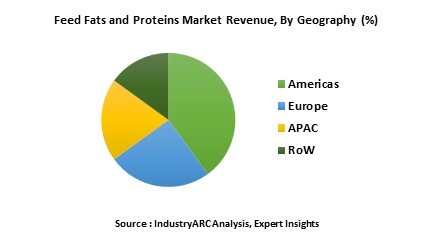 APAC dominated the global feed, fats and proteins market. The economic development in this region is all set to drive the demand of feed, fats and proteins materials. Major players involved in this market are mainly concentrating on R&D initiatives and new product developments to cater the needs of customers. APAC is the leading market for Feed Fats and Proteins with China and India leading the charge. APAC region is anticipated to have highest growth in the next few years owing to growing adoption of Feed Fats and Proteins in various feedstocks. A strong economic growth and population growth is the key driver of the market in this region. Americas, especially U.S. is the second largest market pertaining to feed fats and proteins followed by Europe. Some of the major factors which fuel the growth of feed, fats and proteins in Europe include growing meat consumption, food safety concerns as well as growing meat prices. RoW occupied the least share, but the consumption is increasing at a greater pace due to the rise in population, change to nutritious food, increased demand in animal proteins, and so on. The global feed fats and proteins market is evaluated based on key attributes such as source, livestock and others. Each of the segmentations in the report has been studied to give comprehensive analysis of global feed fats and proteins market. The overall market has also been consolidated from the perspective of different geographic locations into standard geographic regions and key economies for this market. Additionally, this report encompasses opportunity analysis, porter analysis, pricing analysis and market forces such as drivers, constraints and challenges that are involved to drive the overall market. 10.6. Lansing Trade Group LLC. 10.20. Shouguang Ftl Bio. Co., Ltd.
10.21. Qingzhou Ekato Commercial Co., Ltd.
10.23. Chengdu Chelation Biology Technology Co., Ltd.